In a bowl, place carrots, turnips, parsnips, squash, and garlic, and toss with the oil until coated lightly. Sprinkle the curry powder into the bowl and toss again to coat evenly. Place the vegetables on a sheet pan or roasting pan and roast until light brown and tender. Remove and reserve the roasted vegetables. In a soup pot, add aolive oil, curry powder and onions. Stir thoroughly; cook 5 minutes. Add the prepared roasted vegetables and potatoes. Add prepared Knorr® Liquid Concentrated Base Vegetable. Bring to a boil. Reduce to a simmer; cook 20 minutes. 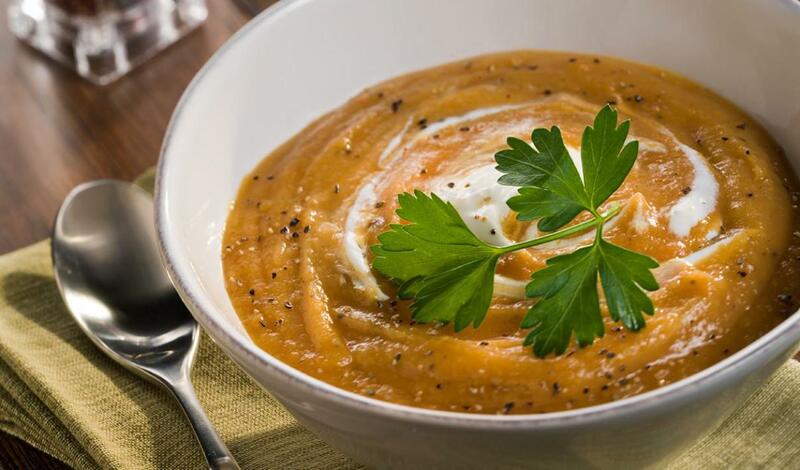 Place soup into a blender and puree until completely smooth or use a vertical hand blender and puree the soup in the pot. Season with salt and pepper, garnish with parsley.